‘Airwolf Extended Themes’ (‘AET’) 2CD 42 tracks, just like the previous 25 tracks of the original ‘Airwolf Themes’ 2CD are brand new recordings of music based very, very closely from the Airwolf TV series. Please understand this from the outset! However before dismissing it, please LISTEN TO THE TEASERS and you'll not be able to tell the difference as these tracks have been pains-takingly recreated over nearly a decade. The die-hard FAN FEEDBACK on Facebook, Twitter, or on this Airwolf Themes website and around the Web will tell you what the true Airwolf fans think if you still need convinced. MAXIMUM of TWO COPIES per customer! As there are only 2000 copies available of the Special Limited Edition 2CD set, we are currently limiting the sale of the 2CD ‘AET’ set to a MAXIMUM of just TWO COPIES per customer. 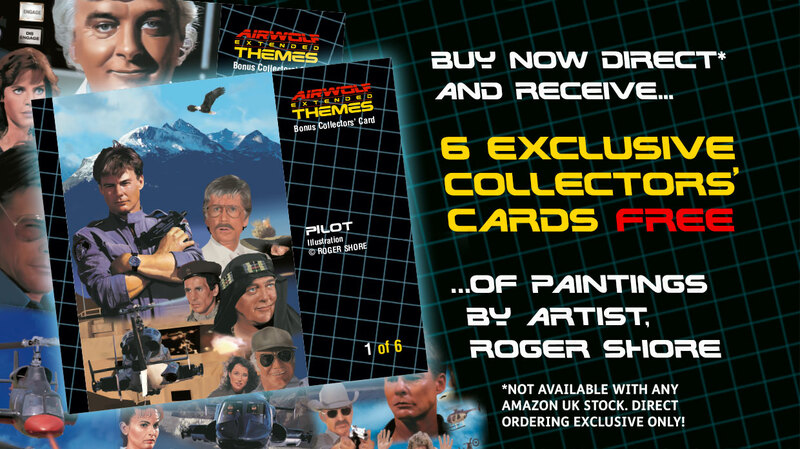 We are offering a special exclusive of 6 Collectors Cards with brand new paintings based on Airwolf episodes by artist, Roger Shore. These will ONLY be offered if you order below directly from AirwolfThemes.com [not from Amazon UK] and pay with PayPal. The Bonus Collectors' Cards are NOT offered on Amazon which only offers the 2CD set on its own, without the Cards. PHYSICAL CDs ONLY AT PRESENT – NO Digital Downloads available. At the moment we are ONLY offering the physical product. We are not selling digital downloads of individual tracks at this time. These will be available in the future though. 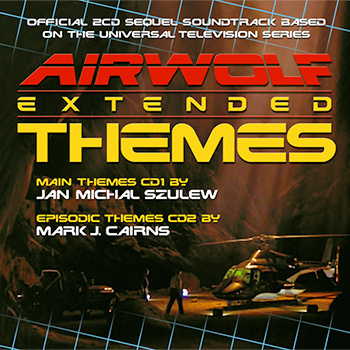 No date has yet been set for the release of the digital downloads version of ‘Airwolf Extended Themes’ (‘AET’). We are also planning to re-release the original ‘Airwolf Themes’ (‘AWT’) again on iTunes too in the future. 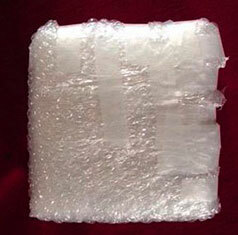 We will be sending your CDs out with good bubblewrap and bubble envelope packaging with the correct, completed customs’ label (if applicable to your country). We are NOT responsible for any extra duties, customs fees, or taxes requested from your country. It is very likely that once our package (coming from here in the UK) enters your country, your (if outside the EU) country's Customs officers may examine the package. We are NOT liable for any damage caused by customs handling or improper transit. The USA Airwolf fans especially will probably experience an extra delay due to your country’s excessively paranoid Homeland Security and Customs’ inspections (post-"9-11") of all packages shipped from “foreign” terrorist-harboring countries, such as here in the UK! We normally ship within 14 DAYS and (depending on your country) you should then allow around 7 days EU shipping after that, and up to 21 days for USA and Rest of World shipping, which would allow for your country's Customs' inspections (if applicable – very likely everywhere except inside the EU countries and the rest of Europe). We will endeavour to e-mail you a tracking code so you can track your parcel once despatched. This will be handled from within the system in PayPal, which is where we will enter the tracking code, thus a Despatch E-mail will come FROM PAYPAL via us. All Amazon orders will be Fulfilled directly by Amazon. Note that the Royal Mail will hand off to your a local postal delivery service within your country. e.g. in the USA, after a few days you can switch from RoyalMail.com to USPS.com as the latter will be used to track delivery to your door. By clicking and ordering below, you have acknowledged that you’ve read and understood the product's details, plus our shipping practices and logistics times. This is to avoid any potential disappointment or misunderstanding. *TWO copies maximum per customer.